Your calcaneus bone forms the heel at the rear of your foot and provides an attachment point for your Achilles tendon. Fractures in this bone come in several forms and can seriously degrade your ability to walk and perform everyday tasks. You can recover from these fractures with the help of a doctor-approved rehabilitation program. Most heel bone fractures stem from high-energy physical impacts or collisions, according to the American Academy of Orthopaedic Surgeons, or AAOS. Depending on the severity of the impact that causes your fracture, you may have a relatively straightforward, simple injury or a more complex injury that causes displacement of the broken ends of your heel, penetration of your skin, damage to supporting soft tissues or multiple bone breaks. The severity of your fracture also determines whether your injury requires surgical or nonsurgical treatment. However, whatever treatment you receive, the guidelines for your rehabilitation will remain more or less the same. The only real difference is in the length of your recovery. The aim of rehabilitation for a heel bone fracture is maintenance of your day-to-day independence while you regain your range of motion, strength, endurance and ability to accurately sense the position of your limbs, MD Guidelines explains. As soon as your pain levels are reduced, you will start mobility exercises for your foot and ankle. A physical therapist can help you with these exercises, as well as exercises that improve your foot and ankle strength. Please note that these exercises will likely temporarily increase your foot pain. However, they are an essential part of your recovery. When you recover enough to put weight on your affected foot, your doctor and therapist will ask you to start performing walking exercises, which may require the use of a cane and/or a protective boot. If you received a cast during your fracture treatment, your doctor and therapist may also ask you to perform range-of-motion exercises to improve the function of your surrounding joints. Once your cast is removed or you progress in your walking therapy, you will start performing additional mobility, strength and balance exercises designed to ease you back into your pre-injury routine. During the course of your rehabilitation, you may need as many as 20 visits with your physical therapist, MD Guidelines notes. In many cases, your injured bone will heal within six to 12 weeks, but it may be as long as several years before your bone can withstand high amounts of physical stress. 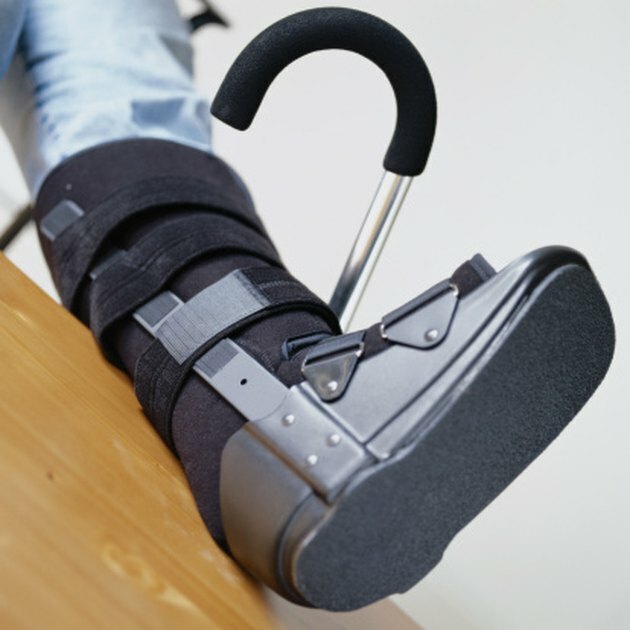 Fracture-related problems that can continue after rehabilitation include pain from a permanently deformed bone, permanent changes in the way you walk and irritation of your heel region when you wear shoes or other footwear. Consult your doctor and physical therapist for additional information on heel fracture rehabilitation.